Hello my dears! I trust most of you got your shopping started on Black Friday and Cyber Monday, but don’t hang up your credit cards just yet– holiday gifting season is just getting started! While holiday shopping is really fun for the most part, it can also be stressful! This month the Michaels Makers were asked to come up with creative and fun holiday hacks and tips to help relieve some of that stress and make holiday entertaining and prepping fun! Note: I love personalizing my DIY gift baskets with creations I made using my Cricut. Now is the time to buy one, and I found this amazing cheat sheet / ultimate list of Cricut Black Friday deals from Baby Savers. It has absolutely all the details you need to get the best Cricut! 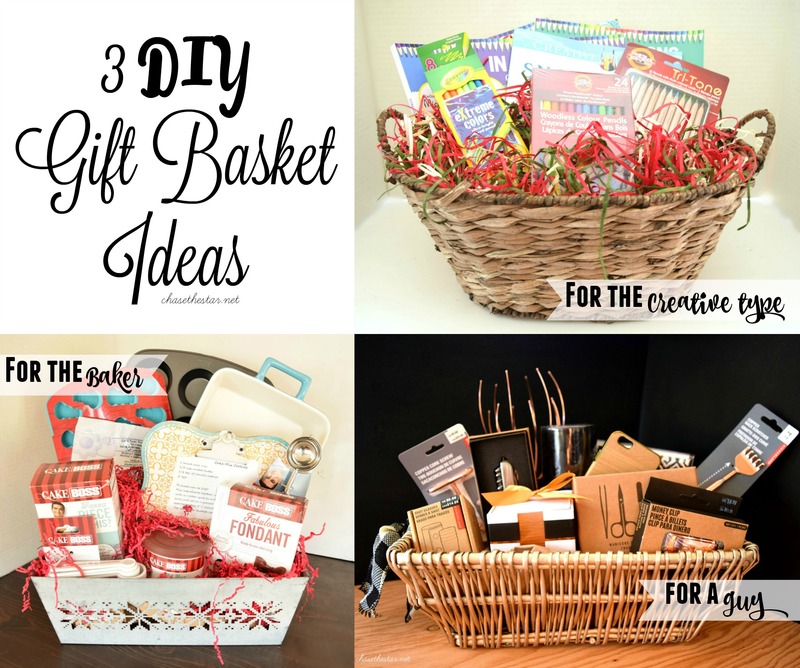 I decided to come up with 3 easy to make last minute DIY gift basket ideas. I chose ideas for those that can be say, um, a wee hard to shop for (you know who you are)! 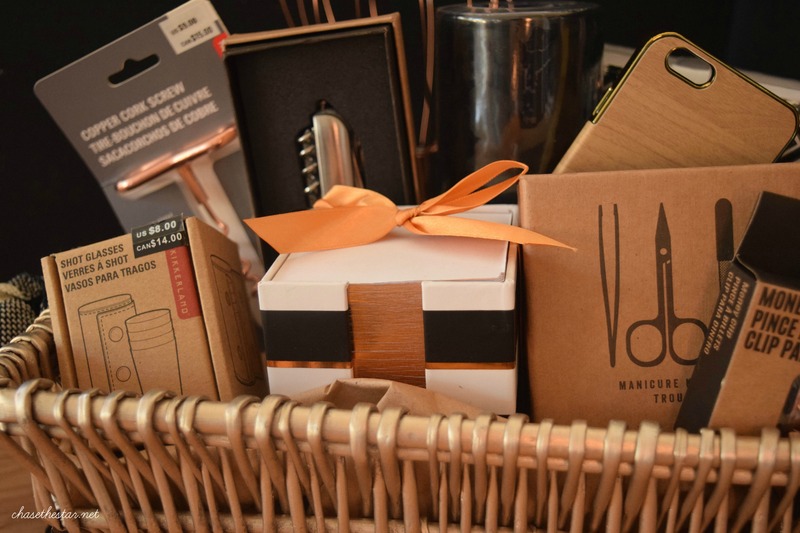 These 3 gift basket ideas are versatile for many of the personalities we love in our lives! In my case that’s a baker, a creative type, and a DUDE! Check out the other four holiday hack topics and the unique ideas all of the makers came up with on Michaels’ blog, The Glue String! These baskets were super easy to throw together in just one trip to Michaels. They have all the baskets, fillers, and gift items needed to put these together fast, even on your way out the door! 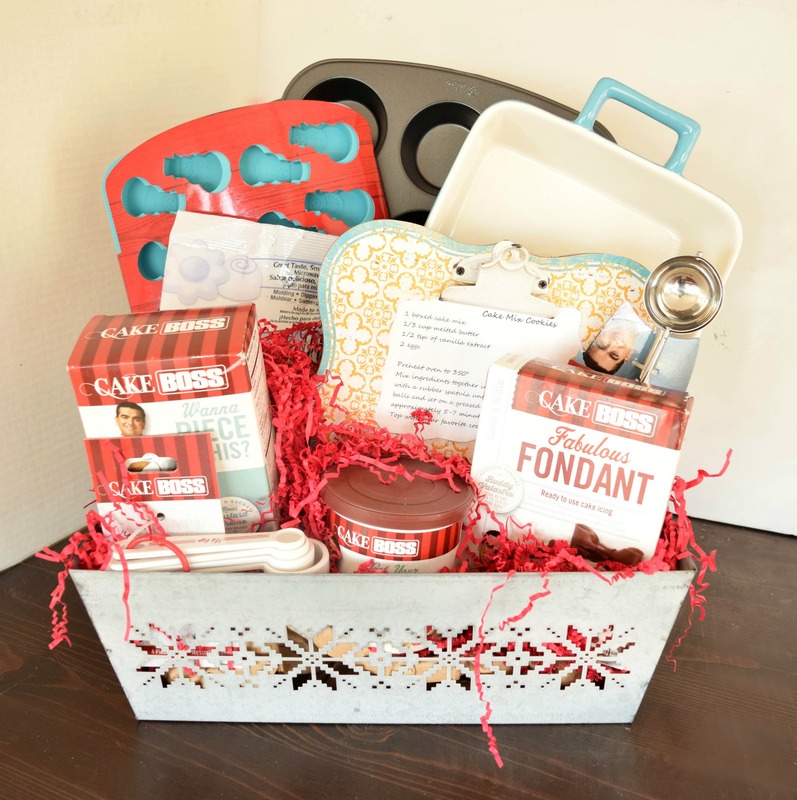 The first basket I made is perfect for the baker or culinary lover in your life! I love Cake Boss mixes, fondant, and frostings so I picked up one of each, and added a cookie sheet, a muffin tin, a pretty blue cake pan, a holiday mold, and candy melts. 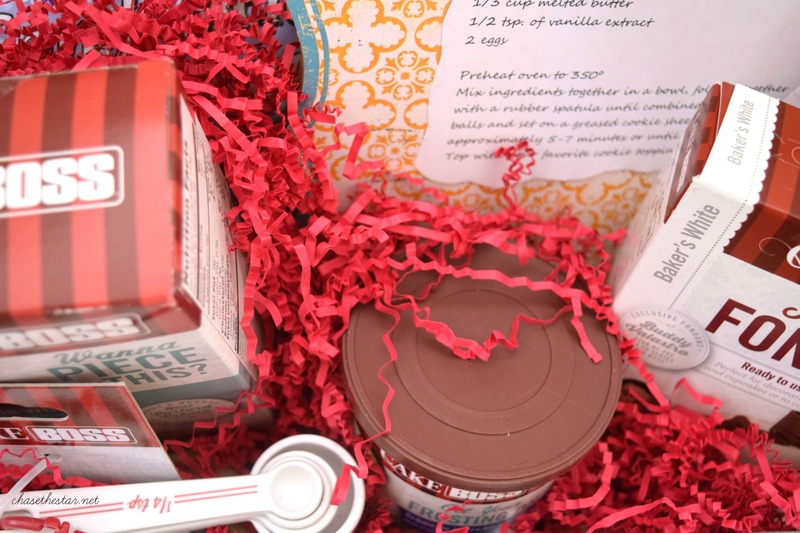 Accessories such as a cookie scoop, a measuring spoon set, and a recipe card holder round out the basket. Of course I didn’t forget to include a tasty recipe for Cake Mix Cookies. Now they have everything they need to make them! I placed all of the items in a rustic holiday galvanized metal basket, and added some red paper crinkles to finish it off. Did you think I’d forget to give you the cookie recipe? Scroll down to the end of the post for the Cake Mix Cookie recipe! 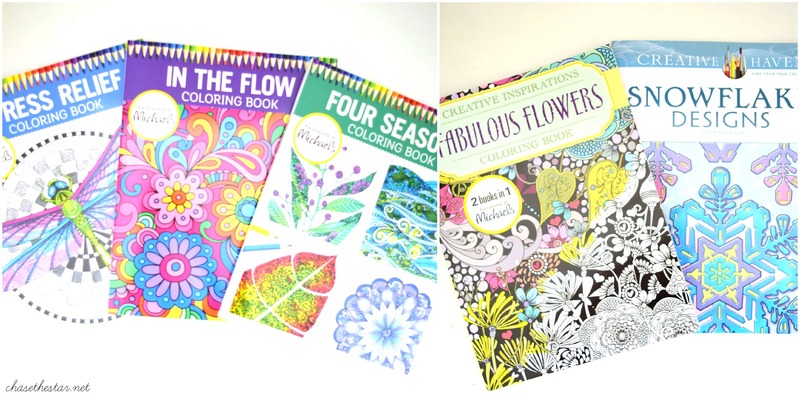 If one of your loved ones is into the latest adult coloring craze they are not alone! This trend is everywhere these days, and Michaels is certainly no exception. This was by far the easiest basket to put together, I choose 5 coloring books. 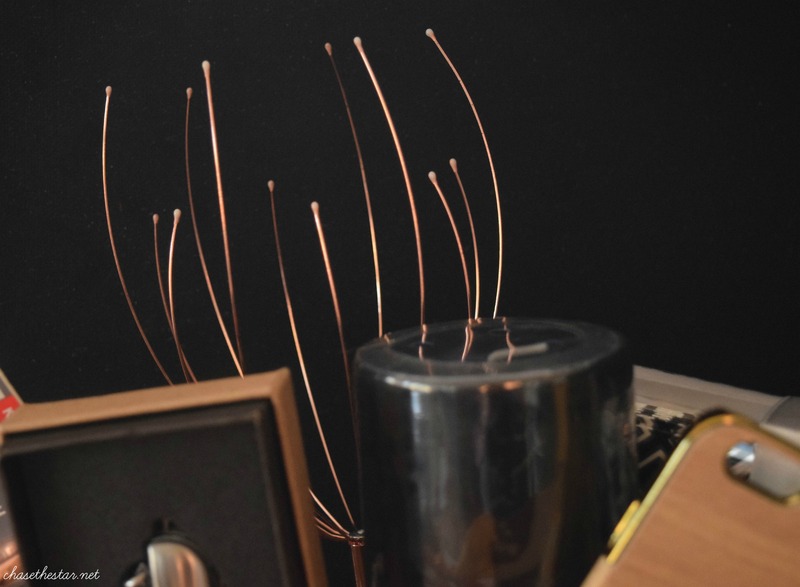 This will keep the recipient busy for hours! Think: plane trips, waiting rooms, their kid’s practices, so many opportunities to put down their phones and let their creative juices flow. 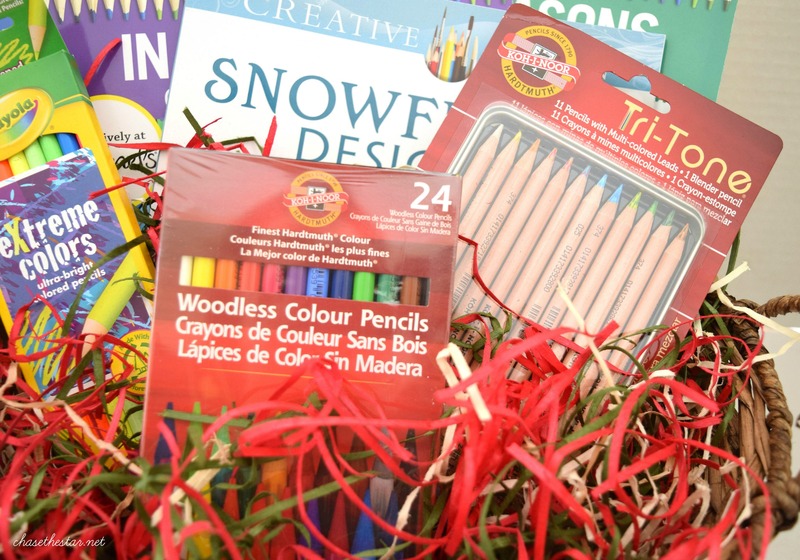 Like I said, this one was simple, 5 coloring books, 2 packs of specialty colored pencils, 1 pack of Crayola pencils, Extreme Colors–sometimes you want to let your inner kid out to play, am I right?! 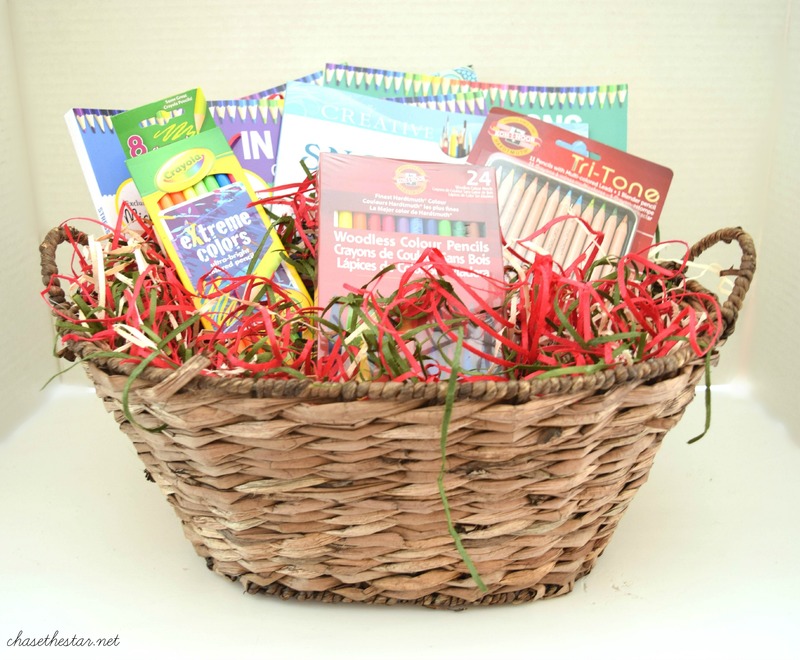 A wicker basket and multi colored paper crinkle make this one of my favorite gift basket ideas by far! Lastly, there is always a guy in the group that is hard to shop for. 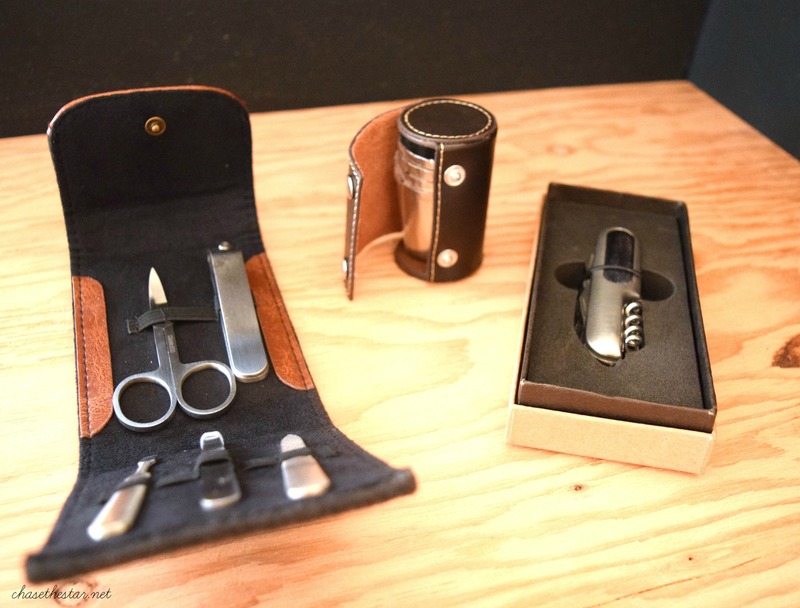 If you have a guy that likes to look sharp then this is the perfect basket for him. This one is no fuss, simply place the items in the basket and call it day. 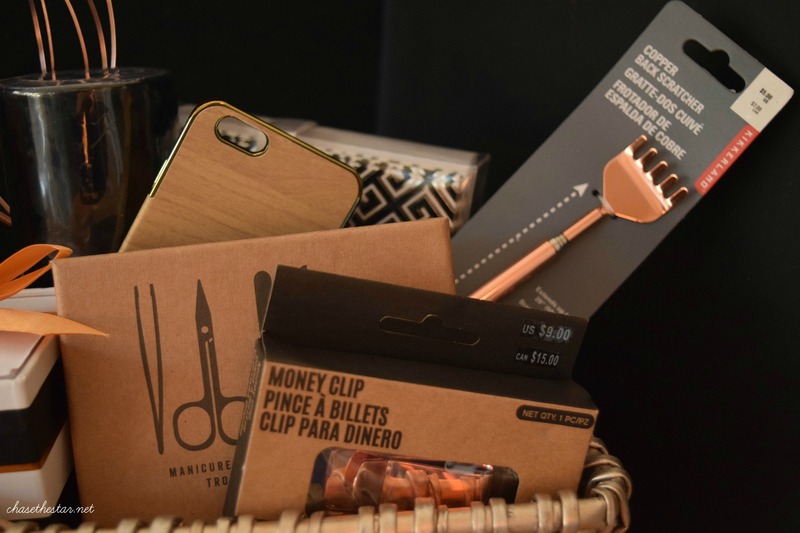 I used a gold wicker basket to hold all sorts of manly items such as a head scratcher, a back scratcher (notice a theme there), a wood grain phone case, a black pillar candle, a manicure set, a small pocket knife set, a set of stainless steel shot glasses, a cork screw, money clip, note cards, and note paper. Talk about an easy last minute gift, this one can be assembled in the car on the way to the holiday party (only if you’re the passenger!). Perfect for an office gift, any ‘dude’ in your life will love it! Stop at Michaels on the way to the Christmas party, check. Put gift basket together in 5 minutes or less, check. Show up with the best looking gift to the party, check! Michaels has tons of holiday project ideas and instructions on their Michaels.com, including gift wrapping, home décor, last minute gift ideas, hostess gifts and more. 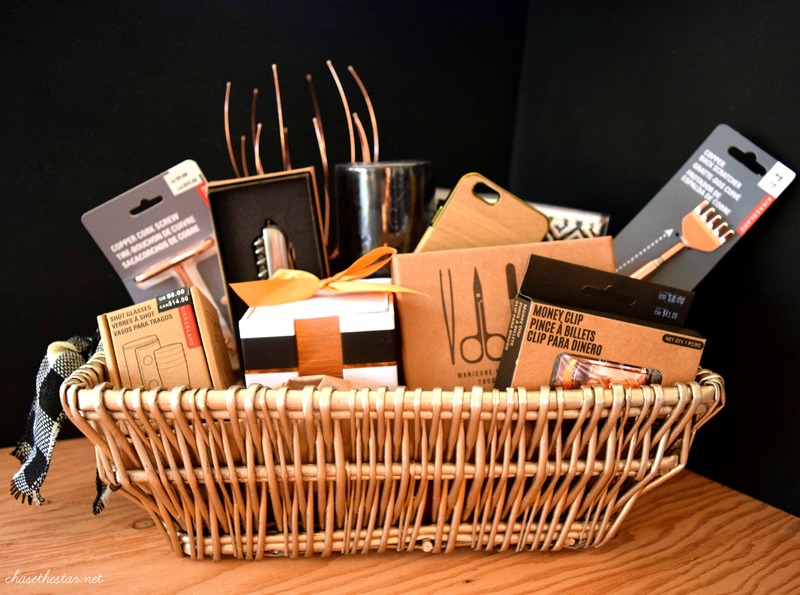 Who do you know that would love these DIY Gift Baskets? Preheat oven to 350º. Mix ingredients together in a bowl, folding together with a rubber spatula until combined. Roll into 1? balls and set on a greased cookie sheet. Bake for approximately 5-7 minutes or until bottoms are golden. Top with your favorite cookie toppings! See below for more holiday hack ideas, and don’t forget to see them all on Michaels’ blog, The Glue String! These are all fantastic gift ideas!! Thanks for the inspiration! !